Even though the event has only been running a few years, there is already a culture and settled vibe about it. 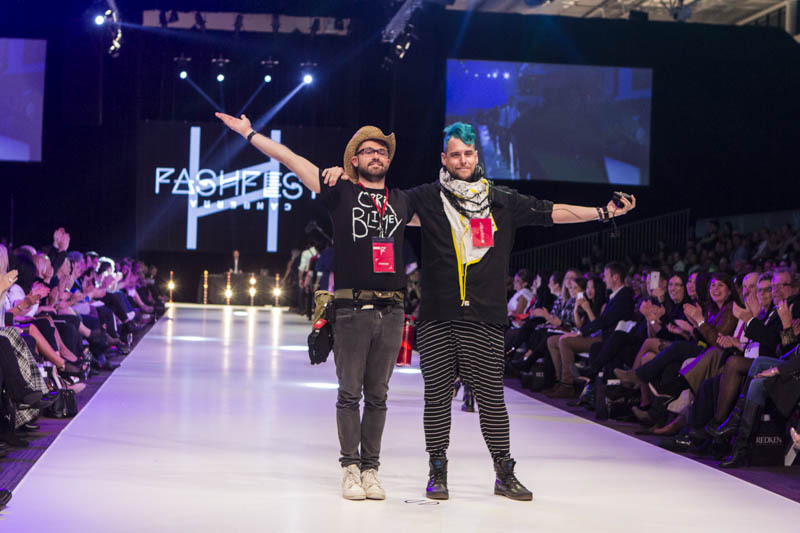 Saturday night’s collections projected us into the future of design in Canberra and the whole event has set a high bar for Fashfests to come. Magnifik, Chanel Cole, Chris Clucas, Kayo Marbilus and Mondecreen worked throughout the night to create futuristic, smooth and even electronic sounds to help paint the picture of the Engineer. The first thing that came to mind, as the Zilpah Tart collection was presented to the expectant audience, was a modern Greek goddess. Yumi Morrisey’s pieces were a fantastic combination of blues, golds, navy, white and metallic embellishments to create heavenly pieces that flattered the female figure. This was a stunning and striking range and the perfect way to kick off the night. The goddess mindset was then carried into the Boho Bird collection of bohemian and feminine pieces. But instead of Greek, a tropical and free-spirited goddess was formed. Delicate and bright prints were combined with nature inspired headpieces. Every single work brought wow factor. The makeup was perfectly matched with the whimsical theme, consisting of earthy colours to create a natural look. Pieces included metallic embellishments to catch sunlight which is what made this collection stand out from the current bohemian trend and take it to the next level: the future. This was very reflective of ‘the engineer’. Simone Perele French lingerie collection really went above and beyond in the final night. Creating a theme with lingerie can be a little more difficult but corsets and body structure were what took this particular set to the next level of lingerie fashion. Evidence of risk-taking was clear in the range of shapes and lines that went beyond the usual sweetheart neckline to straight necklines. This worked perfectly and displayed the excellent versatility and creativity of Fil Barilaro. Cameron & James created futuristic art to life on the catwalk. Double-plaited beards, broken marble prints and body paint created the modern viking. This was a very striking collection and has set a real challenge for modern trends to look forward into a culturally-inspired direction. CIT students blew the captivated audience away once again with a combination of designers displaying their work. Sparkling and coloured hair set the tone for the eccentric pieces that consisted of monochrome, long lines and some pastel pieces with light sparkle. The talent coming out of CIT design school is incredible. Karen Lee’s Assemblage Project had one thing to say: this is the norm-core of the future. Her contemporary pieces of mainly black and white showed much versatility and worked different styling of layers to create a future street style prediction. Floor length coats set the beginning scenes of Louisa de Smet’s collection of Corr Blimey. Monochrome was the main theme with some warm deep reds added into some pieces. Abstract shapes and uniquely folded materials left one feeling as though this was something we are out of touch with but want to strive for. Grey/silver colouring created mechanical, slick and robotic pieces that seemed they were from another world. Overall this was a fantastic end to a spectacular Fashfest 2015.